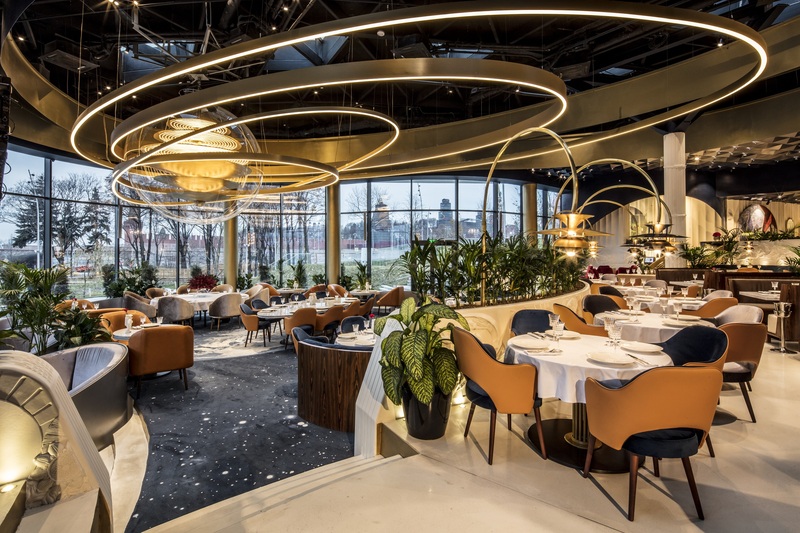 To create a restaurant that does a contemporary interpretation of the cuisines of the peoples of the USSR in the very center of the famous Zaryadye park. 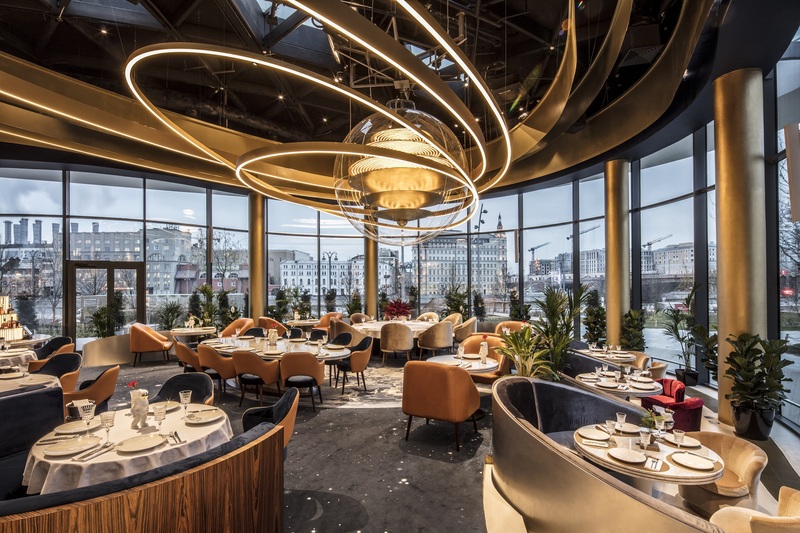 In this the main difficulty was posed by the exclusivity of location, its status and significance, for it claims to be the central restaurant of Moscow. 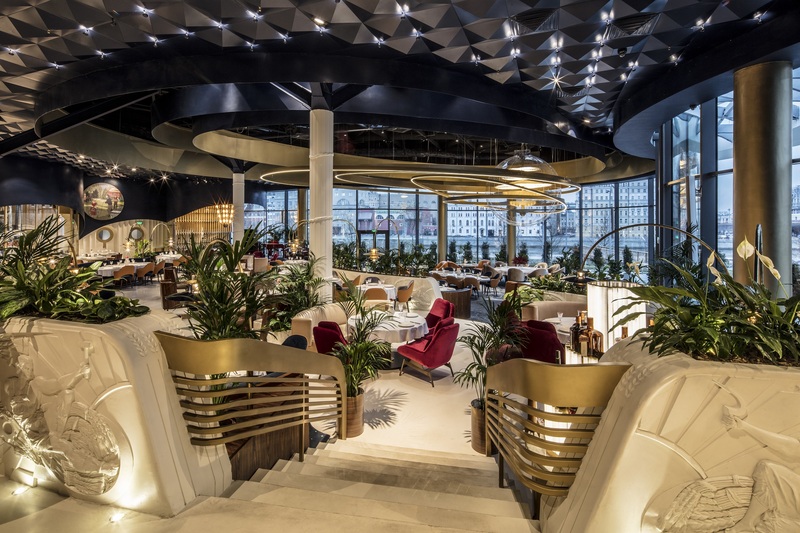 It was necessary to take into account the very architecture of the super-modern Zaryadye park with its smooth natural lines: “Voskhod” should be its natural continuation. 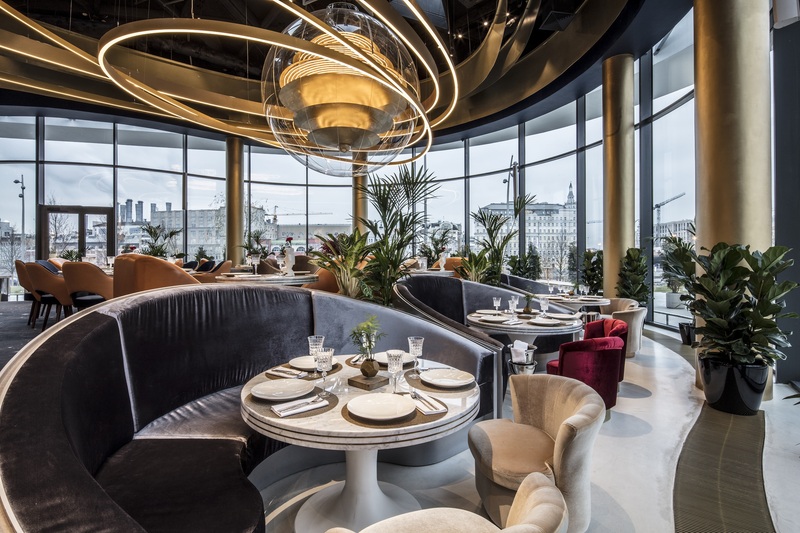 To create a relevant and delicate ensemble of ultra-modern spatial architecture and nostalgic notes, which themselves represent the theme of the kitchen the culinary masterpieces of the Soviet era. At the same time, we wanted to pay tribute to the past: both the history of the place itself, and the heritage of the Russian avant-garde, art deco and the era of conquest of the cosmos. This theme was chosen with a special purpose – in the 60’s every child in Soviet Union dreamed of becoming an astronaut and going into space on the “Voskhod” rocket. 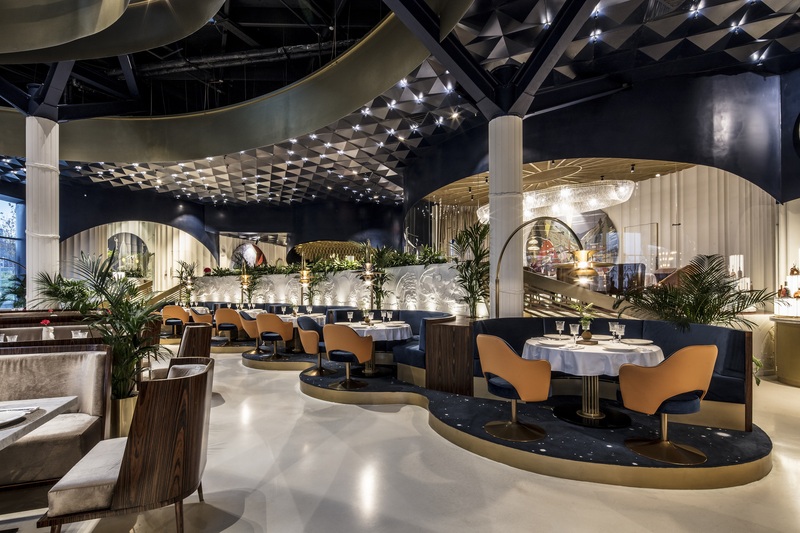 In order to combine and fulfill all the tasks in one interior, the modern reading of the 60’s style suited perfectly – with its cosmic futurism and the addition of cutting-edge details to the restaurant’s interior. Unique molded bas-reliefs that combine the theme of nostalgia for the past and dreams of space have been designed for the project. 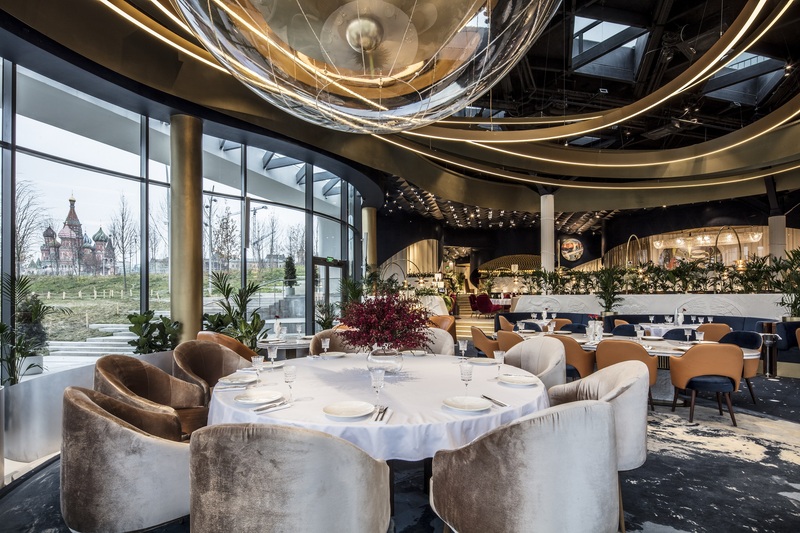 The light is not less important; therefore, we designed a 3,5 meters chandelier that is reminiscent of the movement of planets on their orbit around the Sun. The motives of space are present not only on the ceiling, but also on the floor: the carpet is covered with a pattern resembling Earth’s view from outer space. Furniture also emphasizes the idea of cosmic futurism: spherical sofas, rounded flowing lines of furniture, handrails and chandeliers. This theme continues on the walls in Soviet futurism paintings made by modern artists. To all this, we added cosmic metals, retro futuristic plastic, hyperbolized art objects in combination with Soviet veneer, paintings and even plants of that era. 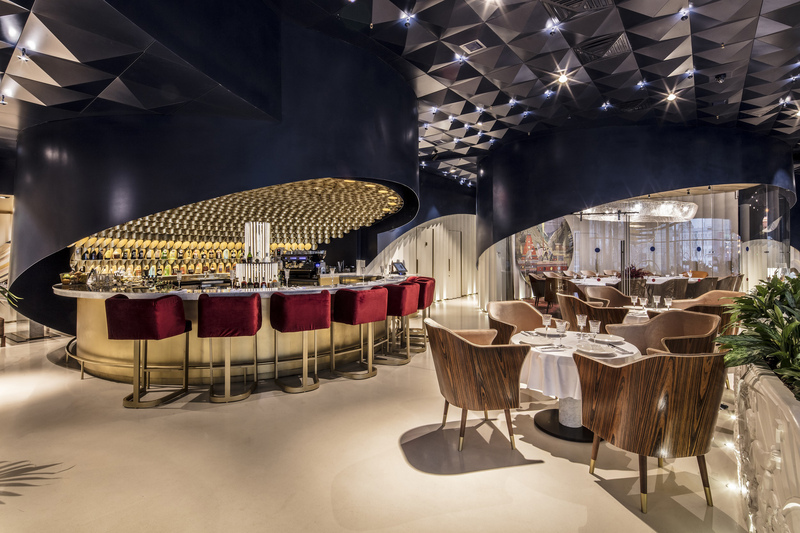 To pay tribute to the “Rossiya” hotel that used to be located at the “Zaryadye” site, we used a dark blue molded ceiling in the interior – a detail reminding of this hotel’s restaurant hotel as an elegant and subtle hint of the Soviet past.